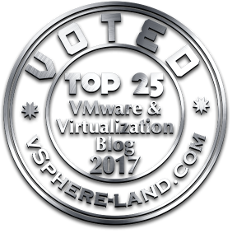 You searched for VCA-CLI - VIRTUALIZATION IS LIFE! vCloud Director has always had a rich set of APIs (API Online Doco Here) and as I blogged about last year Paco Gomez has been developing a tool called VCA-CLI which is based on pyvcloud which is a Python SDK for vCloud Director and vCloud Air. 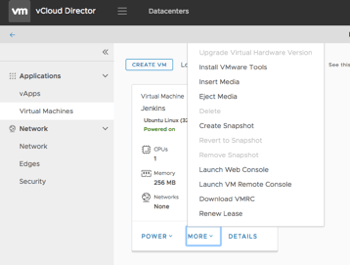 This is an alternative to Web Based creation and management of vCloud Director vDCs and vApps. Being Python based you have the option of running it pretty much on any OS you like…the posts below show you how to install and configure VCA on a Mac OS X OS and Windows and how to connect up to a vCloud Director based Cloud Org. Initial releases of VCA-CLI didn’t have the capability to configure the Firewall settings of a vDC Edge Gateway, but since the release of version 16, Firewall rule management has been added. In the below example, I connect up to my vCD Org in Zettagrid, gather some information about my vDC, deploy a SexiLog VM template, set the Syslog setting on the Gateway and then configure a new NAT and Firewall rules to open up port 8080 to the SexiLog Web interface. 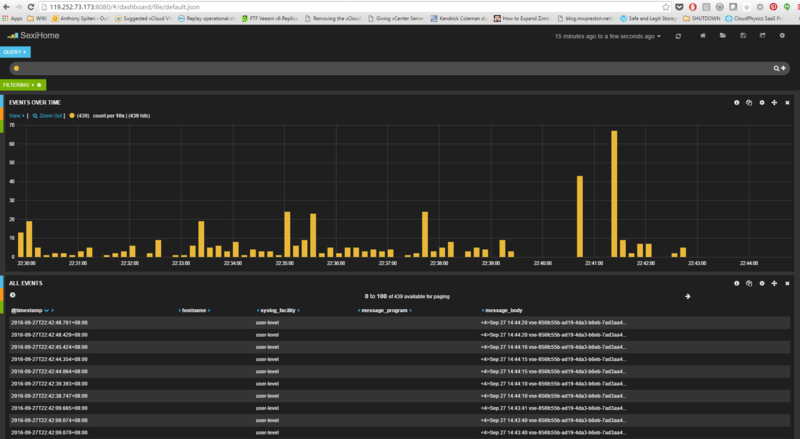 Again, this highlights the power of the vCloud Director API and what can be done with the pyvcloud Python SDK. 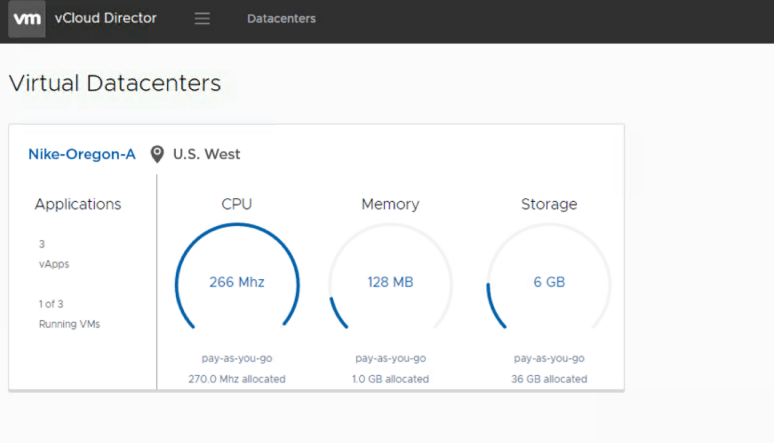 Once perfected the set of commands above can be used to deploy vApps and configure networking in seconds instead of having to work through the vCloud Director UI…and that’s a win win! Interested in being able to offer my partners and clients an alternative to Web Based creation and management of vCloud Director I stumbled across a project that Paco Gomez has been developing called VCA-CLI which is based on pyvcloud which is a Python SDK for vCloud Director and Air. Being Python based you have the option of running it pretty much on any OS you like…the steps below show you how to install and configure VCA on a Windows 8/10 OS and how to connect up to a vCloud Director based Cloud Org. VCA-CLI is built on the Python SDK for vCloud Director and requires Python to be installed and configured on the Windows OS. While you don’t need PowerCLI to run the PIP and VCA-CLI commands I like the option of being able to connect to vCloud Director or vCloud Air within the same window using the Connect-CI command. 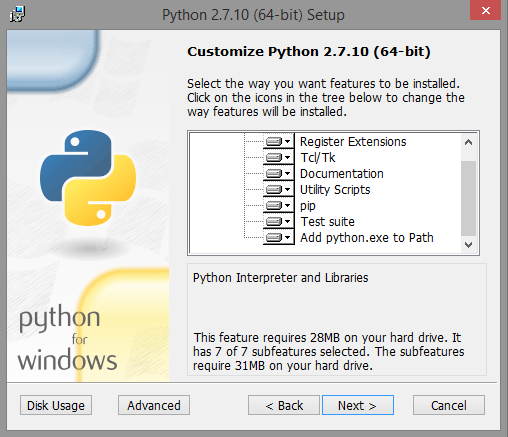 Head to the Python site and download the installer…I discovered an error while trying to install VCA-CLI with Python 3.4.3 and the 3.5.x builds so you want to go with a 2.7.x version. 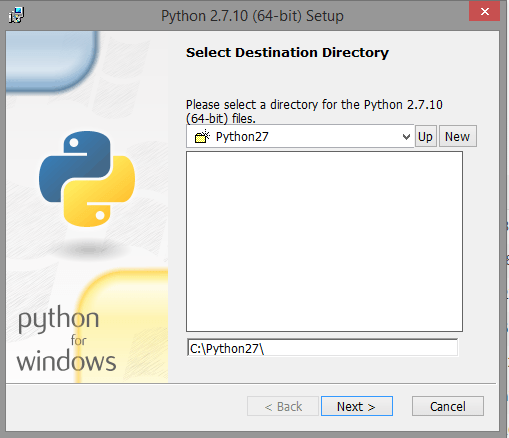 Choose the default directory and make sure in the next step you select the option to Add python.exe to Path to make things easier to execute pip and vca-cli. As you can see PIP has also been chosen for installation so now we are ready to install VCA-CLI. Assuming you have installed PowerCLI (latest version 6.0 R1) fire up a PowerCLI session and confirm that pip is available. 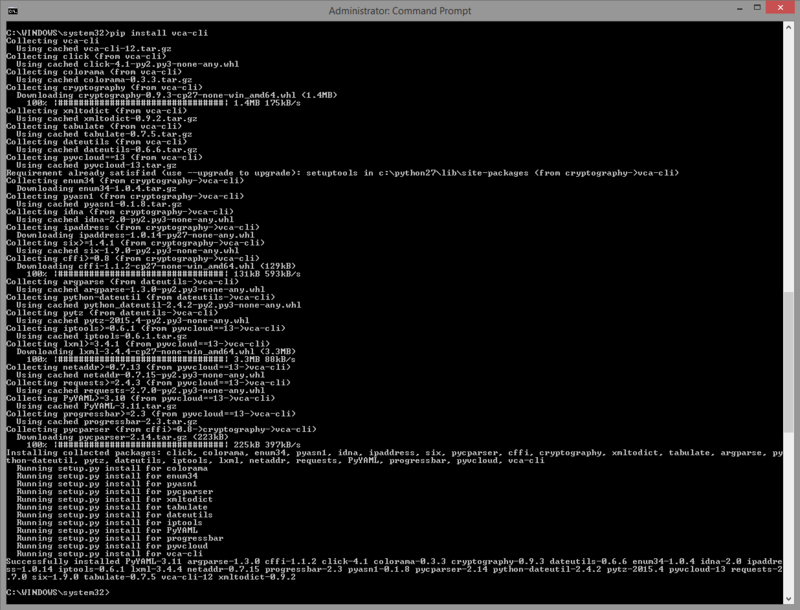 PIP will go off and download all the required components and configure VCA-CLI. 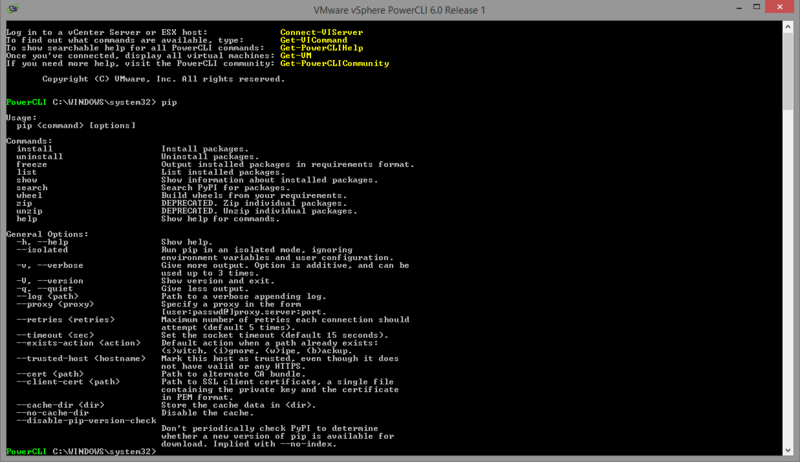 Open a PowerCLI window and check to ensure that VCA-CLI has been installed as shown below. 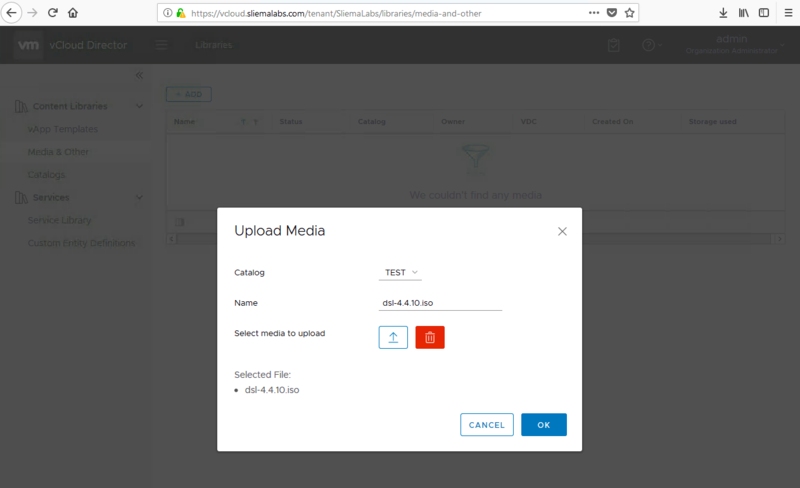 In the second example below I am connecting up to my vCloud Air On Demand Service. All ready for action…I’ll be looking to post some more articles around VCA-CLI and how to interact with the commands to deploy VMs and Applications on ZettaGrid…which can then be taken and applied to any vCloud Director based Cloud…such is the power of the vCloud Air Network!